Again an update with some bug fixes but also a nifty feature that helps importing existing campaigns: a bulk import keyword function. We made a function where you can import all your keywords at once. So if you have a list of keywords for a campaign, you do not have to guide those 30-at-a-time through the keyword research process. Now you can just import them all in one go only maximized by your campaign level. This is handy for people who know already know what keywords they want to optimize their site for. If you are not 100% sure what keywords to use in a campaign, using the keyword research process is still your best bet! How does the bulk import keyword function work? 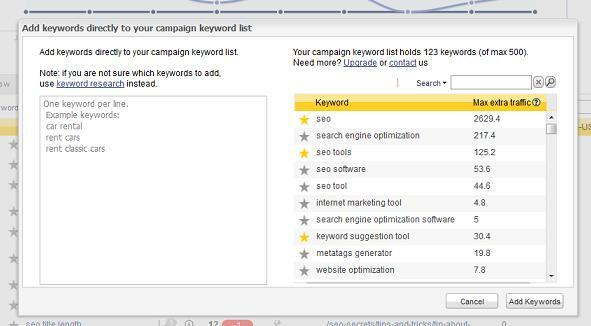 So feed all your keywords into your campaign and start right away with tracking rankings or optimizing pages! If analytics is connected to your campaign, it will also fetch traffic for those keywords. This takes a number of minutes. Within a day, you will have rankings too. Don’t forget to set your competition if you have not done so already (see ‘edit campaign’). Where to find the bulk import keyword function? Look for the ‘ + Add keywords’ button! Local rankings have become more and more important after Google’s Venice update. Do a search for a local service and Google tries to guess your location and tailors the results to that location. We are testing localised SERPS in SEO Effect and it looks promising! What does a local result look like from Amsterdam, Berlin, New York or Naples? Important if you sell local or need local presence.